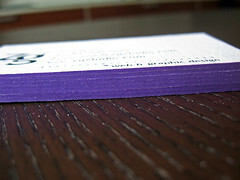 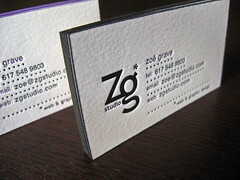 Edge coloring the same letterpress card in two different colors. 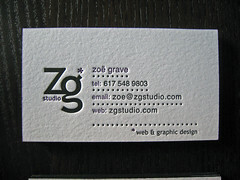 In this post we wanted to share business cards we printed a while back for Zoë Grave of ZGStudio, a web and graphic design firm located outside of Boston, MA. 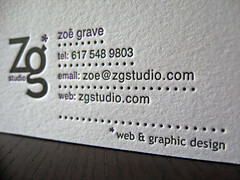 Zoë was excited to create letterpress business cards but wasn’t sure what works best. 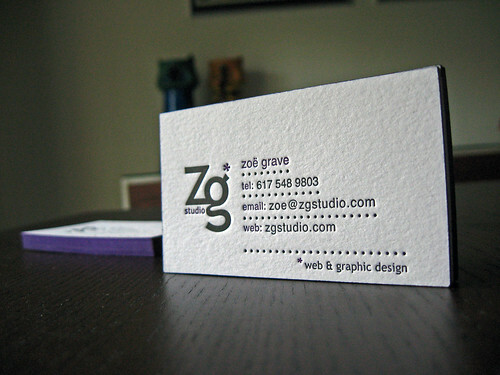 We were happy to help her finalize the design with elements that compliment the letterpress process. 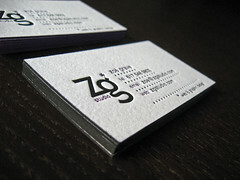 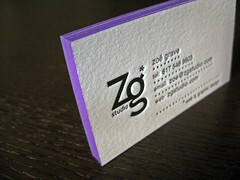 The business cards were printed on Crane’s Lettra in fluorescent white (220lb). 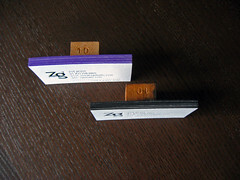 The thick 220lb stock provided two benefits: first, it allows for a heavy impression with no bruising on the back and second, a thick edge to show off the edge coloring. 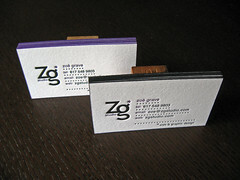 The cards were printed in two passes through the press, once for the black, and a second time for the purple. 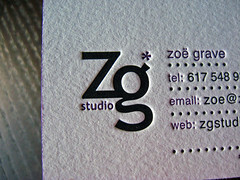 Zoë wasn’t sure if she wanted purple or black edges so we split the finished cards in two and colored half of them in black and the other half in purple to match the printed colors. 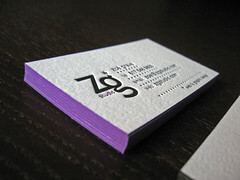 We’re partial to the purple as we really like how much it pops, but the black turned out great as well.